Testosterone BoostersFA Nutrition Xtreme Test Stack - 120 kaps. FA Nutrition Xtreme Test Stack - 120 kaps. You have in front of you a unique set of trace elements zinc and magnesium and vitamin B6 in a special anabolic formula and unique blend of extracts of Tribulus terrestris and fenugreek. Bet on a proven product! You want more than a colored packaging and convincing descriptions? You expect efficiency in action, deliberate and safe composition? 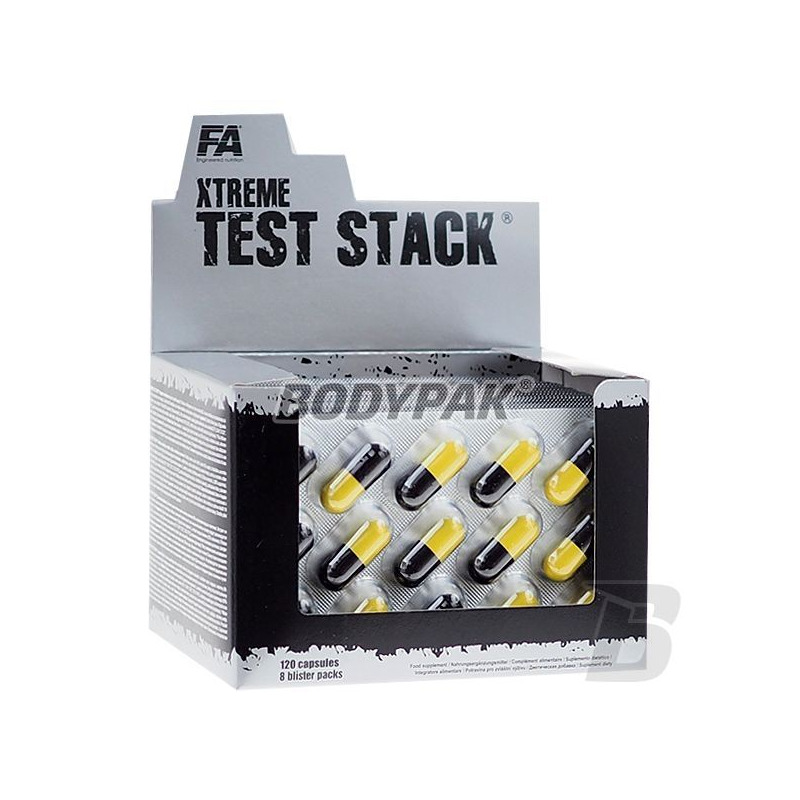 Perfectly, the answer to your expectations is the FA XTREME TEST STACK®! This supplement is not established within 5 minutes but is the result of many weeks of work the best specialists in the industry - so you can enjoy the maximum effects of their work! FA XTREME TEST STACK® was created and prepared for those who want maximum results in strength and muscle mass after each training session. Specially designed anabolic formula provides the body physiologically active substance which activates the secretion of natural hormones that support muscle anabolism. XTREME TEST STACK® effectively supports building lean muscle mass and improve strength, allowing you to exceed the natural barriers of the body. Ingredients: extract from the seeds of fenugreek (Trigonella foenum-graecum L.) extract of the fruits of Tribulus terrestris (90% saponin) (Tribulus terrestris L.), magnesium citrate, capsule [gelatin, water, dyes (E171, E104 *, * E122, E133, E110 *)], fillers (microcrystalline cellulose, calcium hydrogen phosphate), anti-caking agent (magnesium stearate, silicon dioxide), zinc sulphate, vitamin B6 (pyridoxine hydrochloride). * It can have an adverse effect on activity and attention in children. Nutrend ZMA - 120 kaps. The unique combination of magnesium, zinc, and a good dose of vitamin B6. Supports swapping natural testosterone levels. Accelerates the anabolic processes and post-workout recovery. Convenient form of capsules. Packing lasts for 40 days until the full supplementation! Top quality at a good price.